sometimes it’s not a problem if your script doesn’t perform exactly as expected — it simply fails to complete the task and you have to either fix it or live with it. but sometimes it IS a problem because an error can stop a complex process mid-script. sometimes an error can even crash InDesign. sometimes you learn this the hard way. error handling involves anticipating potential problems and building safeguards into your script. the printing script has error handling in the form of an if/then statement. the script works fine without it, right up until the first time you hit the ‘cancel’ button in the choose from list dialog box — that’s when the script will crash InDesign. why? because the script will go on to ask InDesign to print every document using an undefined printer preset — this is confusing for InDesign, so it gives up and goes berko. 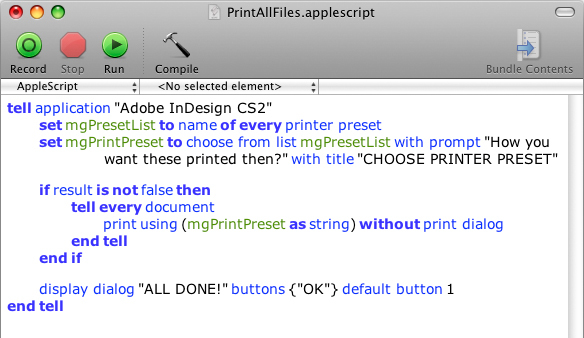 so, we need something in there which will ask InDesign to print ONLY if a printer preset has been selected. the easiest way to do this is to check that the ‘cancel’ button WAS NOT selected. that is, if the ‘cancel’ button was not selected, then the ‘ok’ button MUST have been selected (and the ‘ok’ button cannot be selected until a preset is chosen from the list). make sense? ok — now for your homework. what will the script do if the result IS false (the cancel button is selected)? would that behaviour bother you? if so, how could you improve the script? This entry was posted in applescript, indesign, scripting lesson and tagged adobe, applescript, automation, how to, InDesign, printing, tutorial by macgrunt. Bookmark the permalink. Can you please post the solution for our homework, I am stuck on the ‘cancel’ button error handling. the issue is that it still displays the “All Done” dialog, which is a bit superfluous (and confusing?) and a waste of time. if you wanted it to not do that, you’d just move the “display dialog …” command to before the “end if” statement.